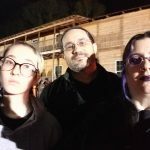 Reapers Realm Haunted House is a Haunted Attraction located in China Grove, NC. Team Jefferson Starship reviewed this attraction on October 21, 2017. 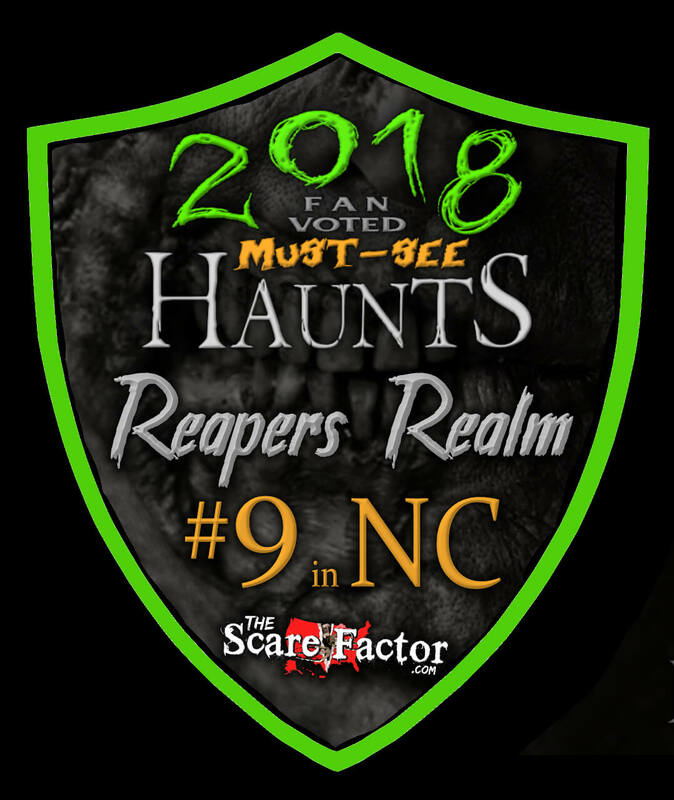 Reaper’s Realm outside of China Grove, North Carolina, is a sprawling haunt with a variety of things to scare and entertain guests. Reaper’s Realm does not use a traditional waiting line. Instead, they assign each group of guests (up to 8) a number. Numbers are then called to make groups of eight to go through the house. While you wait (and if you don’t get there early, you will be waiting), there’s a wide area to sit, hang out, play a handful of video games, watch a fire act, or just enjoy some food. The haunt itself is something you have to experience. Once you enter the front door, you’ll explore a two-story house filled with everything from ghoulish monsters to crazy clowns then venture back outside for some zombie-shooting laser tag (with live zombies) and then, perhaps best of all, a long long walk out through woods, corn fields, and through several small outbuildings and barns before you dig your way out again. Reaper’s Realm brings a lot to the table. It’s definitely worth a trip out to see what they’ve got in store. With cast spread out over such a huge area and across multiple different styles of haunt, there’s (perhaps unsurprisingly) some degree of variation in cast performances. The actors in the various scenes and buildings along the trail were almost uniformly top notch, staying in character and bringing all sorts of creepy dialogue to interact with their “fresh meat,” er… that is to say, visitors. Likewise, the clowns in the house were entertaining, ranging from humorous to creepy. By the last part of the evening, however, the live zombies in the zombie shoot were rather dead (and not the obvious type of dead). This could easily be a combination of the night time chill and the buzzing and chiming headgear strapped on to them to register the laser tag shots. It’s a rough life when you’re one of the undead and it seemed that most of the zombies had had enough. Other haunters in the house were a bit mixed. There were some of the usual “get out’s” or random screams for jump scares, but there were also a few interactive haunters that would stalk alongside the group, keeping up a low level of banter. Costuming at Reaper’s Realm largely works pretty well. There’s a pretty fair mix of masks and makeup used, typically to good effect. Attention is paid to spread the use of masks out across the haunt, sprinkled with other actors solely in makeup or small appliances. Of particular note was the old grump in his shack with skinned hides. His costuming and makeup were done very well. Also, the bevy of clowns, both outside the house and within, were a good mix of well-done masks and appropriate makeup. Care is given to make most of the journey through the Reaper’s Realm a relatively safe one. However, there are a few things to be aware of and prepared for. First, the last half of the attraction is an outdoor walk through fields, up and down hills, and through farm buildings. The trail is largely clear but there are some rough patches. The journey through the “Slop Lot” includes walking through an area where pigs are routinely kept – you’re gonna smell some pig poo and possibly walk through it. Wear some appropriate shoes! Second, there is an amazing bridge that you must cross on your journey. The bridge has its wobbles and shakes, but the safety fence just beyond the bridge can be a bit rough. Finally, there’s an amazing spot inside the house where the clowns scare you into an adjacent pit. It’s a wonderful bit of entertainment, but if you hesitate on falling off the ledge (like one of our team members did) then you run the risk of smacking an elbow on the walkway (like one of our team members did). The simple solution for all of this is to really throw yourself into the show. Wear some warm clothes that you’d be willing to wear to a farm and get (safely) involved in the scenes around you. The waiting area, as mentioned above, has a lot to keep you entertained while you wait – arcade games, fire act, food, wandering actors. While we think it’d be nice to have more actors outside working the huge crowd, we wouldn’t want to take away from any of the other scenes inside. Too, they have a signature Carolina Reaper lollipop that gets used in a test of endurance game (or can just be bought separately) for those brave enough to try. And, finally, parking. Reaper’s Realm draws huge crowds. With a show this good, it can’t help that. But perhaps that great mark of success – huge crowds – also comes the downfall of not nearly enough space for parking. Given that it seems that the surroundings are a working farm, there’s only so much room that can be set aside for parking and unfortunately they’re really pushing the limits on what they can safely fit on the area available. 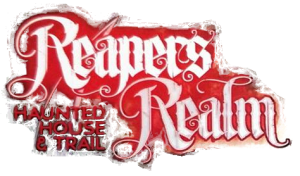 The outside of Reaper’s Realm has a party-style atmosphere with little groups of people hanging out and talking while music blares overhead. This is helped, however, by the huge looming facade of the two-story haunt towering over the crowd and the occasional distant roar of a chainsaw and screams of long vanished guests. The surrounding farm and slightly remote location help add to the haunted house feel, despite the huge crowds and entertaining acts. Reaper’s Realm really brings a lot in terms of special effects, particularly large set pieces. While there is some sound bleed from one area to the next, especially inside the house, overall there’s a variety of effects that really add to the experience. Inside the house, a few of these notable effects are centered through the clown-area turning what would otherwise be a standard set of carnival-themed rooms into an immersive experience that will not only turn you around in circles but also push you over the edge. Outside on the trail, there’s an amazing swaying bridge near the start of your journey and a slide and live burial towards the end that you just have to experience to understand. 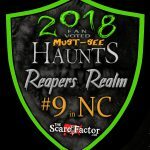 While Reaper’s Realm has some strong overall tones towards a farm full of cannibals, the inclusion of a large clown area, a zombie outbreak on a military base, and random undead and ghosts make it hard to say that there’s a consistent theme throughout. 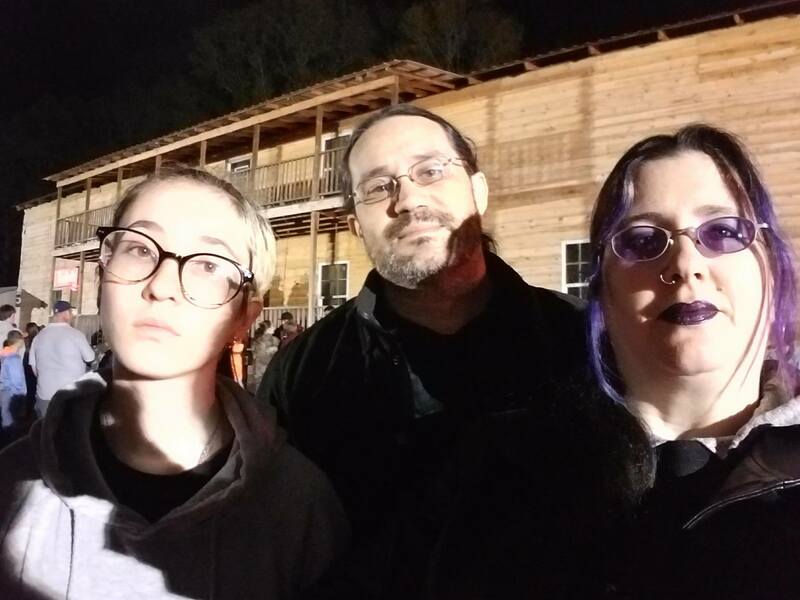 When we went through Reaper’s Realm, the other folks assigned to our group were clearly terrified at points, sometimes rushing ahead of us in fear or screaming in terror and not moving at all. A lot of the scares in the house tend to be front-loaded towards the beginning of the group, leaving those in the back to watch as the people ahead scream in shock. Other places are good at spreading the scares throughout the group. The Slop Lot boys in the pig area were particularly good about this. Likewise, the graveyard and the butcher shop haunters did a good job of working the back of the crowd as much as the front. There are some unique scares spread throughout the haunt, particularly in the clown area inside the house where distraction and disorientation are big players. From the time the front door opens to the time we finally re-entered the front yard, we spent 42 minutes moving through Reaper’s Realm. There are a couple of additional waiting areas inside the haunt (before the zombie shoot and before the trail) that will actually increase the time spent inside the haunt depending on the wait; these areas don’t have any additional queue entertainment besides the music from the front of the house, however. General admission is $20.00 per victim putting this haunt’s MPD (minutes per dollar) at 2.1 which is above average! If you plan to visit Reaper’s Realm, get there early to help avoid waiting times! This is a well done house and trail and you won’t want to miss it.